two images that define monday and tuesday by spuring me into video exchanges with a pc. in each case the pictures expose how slamming asian cultures into western visual architecture (alain renais style french cinema modernism and a sardonic late 70's disillusioned disco-protohipster album cover) can be moderately exciting. 1. the first turning into a video that prada paid " "avant-garde" " - their quotes initially - video artist yang fudong five million grains of rice and a $35 gift card for to make them look great. the idea was that this year is somehow supposed to be a lucky for the company according to the chinese calender. 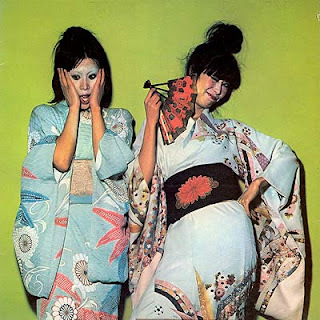 2. kimono themed album cover for something that has nothing to do with kimonos, japan, - or earth. this is "the number 1 song all over heaven".